“Black and Tan Fantasy” was supposedly written about “black and tan” clubs in Harlem that hosted blacks and whites at the same time. The use of Chopin’s funeral march at the end might have hinted at how friendships made at these clubs were sometimes ended by racism and/or jealous lovers. “What Can a Poor Fellow Do?” makes great use Bubber Miley’s “growling” muted trumpet style, just like the A side did. Miley and trombonist Joe “Tricky Sam” Newton are said to have invented it together. This short film from 1933 is a great look at Duke’s orchestra in action, with a lovely vocal turn from Ivie Anderson. Interesting to see how Sonny Greer’s drum kit includes almost every form of percussion that a symphonic orchestra would have. And stick around for hoofers Florence Hill and Bessie Dudley at the end. Hot-CHA. This 1943 take of “It Don’t Mean a Thing (If It Ain’t Got That Swing)” showcases band members Ray Nance and Cootie Williams with simple but elegant vocal turns at the song’s introduction. 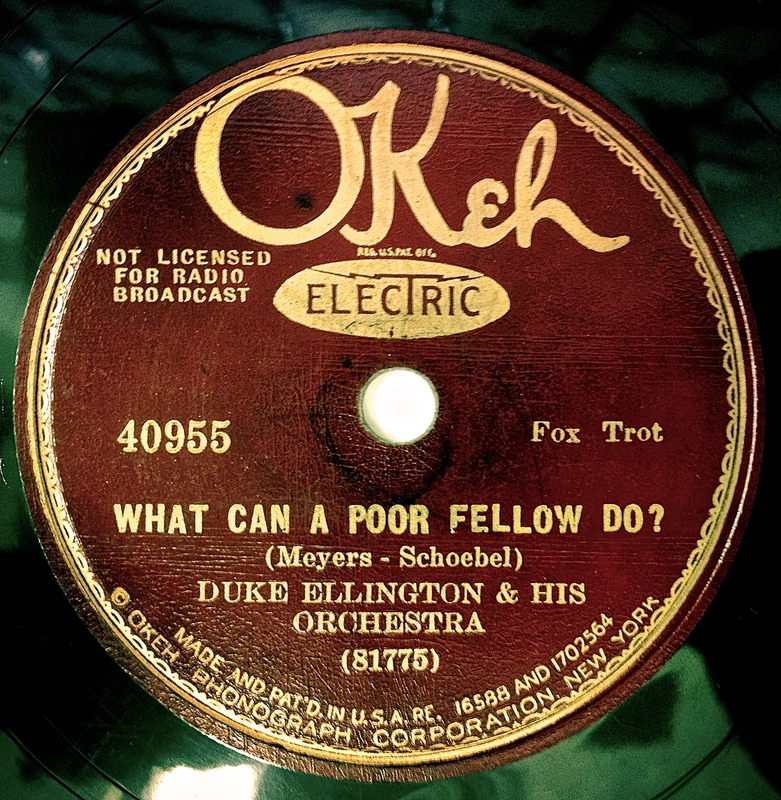 Duke was well known for letting his band members shine, typically writing arrangements to suit the strengths of individual players. This version of “Mood Indigo” is about as smooth as it gets. Can’t tell exactly what year this is from, but that is definitely Louie Bellson on drums, which would put this sometime in the early 1950’s. By the 1960’s, big band music had been eclipsed by rock and roll and rhythm and blues. And jazz was the province of trios and quartets—all the better for individual solos and stylistic experimentation. This 1962 collaboration with John Coltrane proved that Duke was not threatened by these changes in taste, but rather, inspired by them. This is “In a Sentimental Mood,” aka perhaps the best kissing-by-candlelight song ever recorded. Ellington’s original version of the song was composed on the spot when two women were fighting over a friend of his at a party; it was meant to calm things down, and it probably worked. Here it is, from 1935. Duke continued to expand his musical palate, spending his last decade as a recording artist composing suites dedicated to sacred music and music designed for dance pieces. This is the fifth movement from “The River,” a suite that accompanied an Alvin Ailey dance performance that premiered at Lincoln Center in 1970.